So I cracked out on a 1M foil and hooked it up to my mololo thinking I had the mother of all downwinding setups. now I have been going out in all weathers and hitting the gym like a mofo for months now but there's no way I could get this setup flying on a swell. 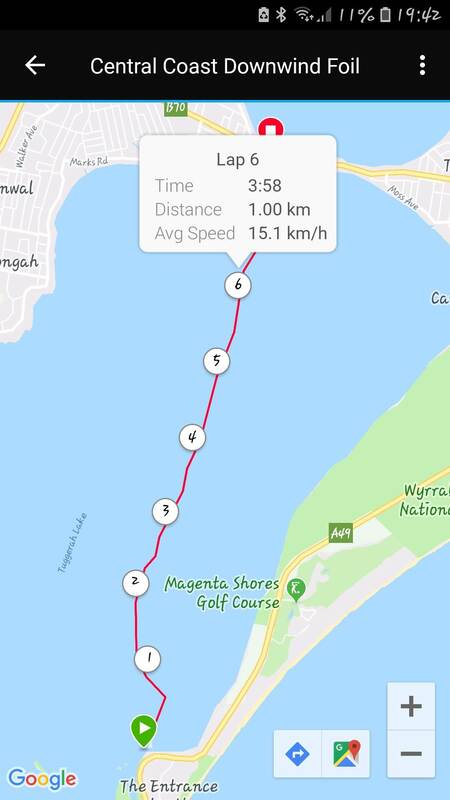 Now I didn't actually downwind - I paddled out agains the wind and turned around so maybe I was missing the whole momentum of several waves one after the other? Also Is the board just too heavy? Unless I am on something breaking I just can't get it up. how do you know when you have enough go to start pumping and paddling -? I have found that Downwind foiling is 80% technique and 20% fitness. Once you learn to unweight the foil it will help you massively, to be honest the board you are riding is probably too long and is sticking to the water which is hurting you trying to get up. Jump on a board with bevelled rails which helps release water really quickly. I found when I first started getting onto runs I would look for two swells close together let the first one come through and try to dig hard into that one and then the second one will get you up but paddle like your life depends on it!!! It has taken me ages to learn how to downwind but it is worth the punishment. I can now downwind in 13 knots which is an awesome feeling, I am not the fittest paddler out there what so ever. I am 78kgs and do all my downwinding on a 6'8 x 28 @108L (the board weighs 6.5kgs) and 102cm wing. As Trav has mentioned. DW foiling is not initially easy. there's so much technique involved. But it is worth every second of punishment you go through. Here's a bit to get your head around. With DW'ing, you are aiming to ride chops, not swells. Ocean swells generally move very fast, and are really hard to catch and even harder to stay on. Foiling DW is all about learning when to change chops and swells. Learning to line chops and swells up is your key to popping up. Sometimes I find myself just standing there in the middle of the ocean letting 4 or 5 swells through until I see a sequence that looks worth going for (don't waste your energy on everything that comes through). In nearly every instance that I have encountered (as Trav mentioned), it seems to be the bump behind the one you think you would get that you actually get. If you imagine the first one as more of a run up, paddle about 80% but let it go, as you come off the back of it, lay the hammer down, 123%, the following bump will just seem to form underneath you and before you know it, you're up (it wont seem this easy at first, but it does get much easier as you get your timing together). As soon as you get any board speed, you need to be un-weighting. The foil will start lifting as your speed increases and the weight reduces. As the foil lifts your speed increases, and so on the exponential acceleration happens. So once you find the right spot to unload all your power, it's just learning the timing for un-weighting and paddling. Here's a pic of how much I un-weight catching swells. I was going to try attach a video, but it's just too hard on this forum. As for the board. There's a few things to take into consideration. When you are flying and everything is going well, the shorter, lighter and better balanced your board setup is the better. However, shorter boards don't paddle fast. So the catch 22 is, so have to get good at pump paddling, get stronger or ride a longer board. I've gone back and forth with sizes and still seem to default back to my trusty 120L 7'6". No matter what the weather throws at me, I am confident that I will get up if it's possible, and know I can limp home if needed. Flight is easy, the board is well balanced and feels super light on the fly. 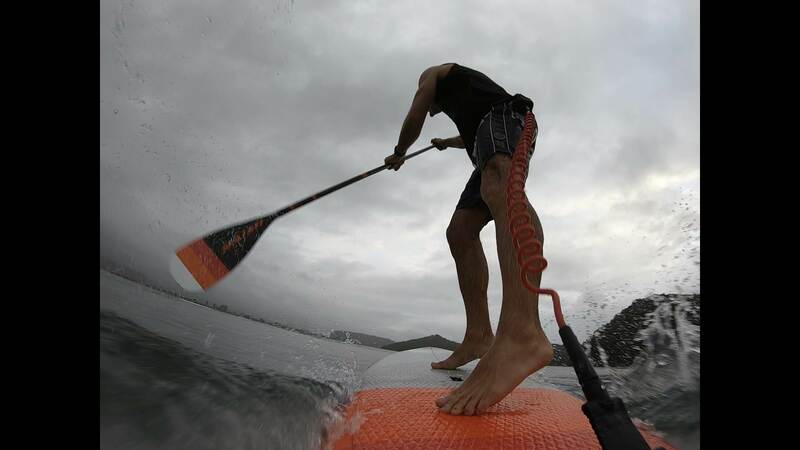 The Malolo board was one of the first ever foil boards. Back when the wings we were trying to DW on where much smaller, and required much faster paddle speeds to get up. Technically, it should still work fine, and I think most of your hurdles are resolvable with practice, but you may find you'll out grown it almost once you get flying. Maybe not?? THere is advantages to fast paddling speeds. Just keep going, don't get turned off. Once you get it, you'll know. And it's awesome. I tried a few different boards and agree with JB. Unless your a fly weight 7'6" is a really the optimal size for a first dwonwind foil board to make it easy to learn. Its all about the method and timing! Just upload them to Youtube or Vimeo, and paste the URL in this forum, and they will automatically be inserted properly. i m starting to get the feel of DWing and love it. But i m getting serious back leg burn. I foil with a front strap and was thinking I may have the strap to far forward making the need for too much rear leg pressure. 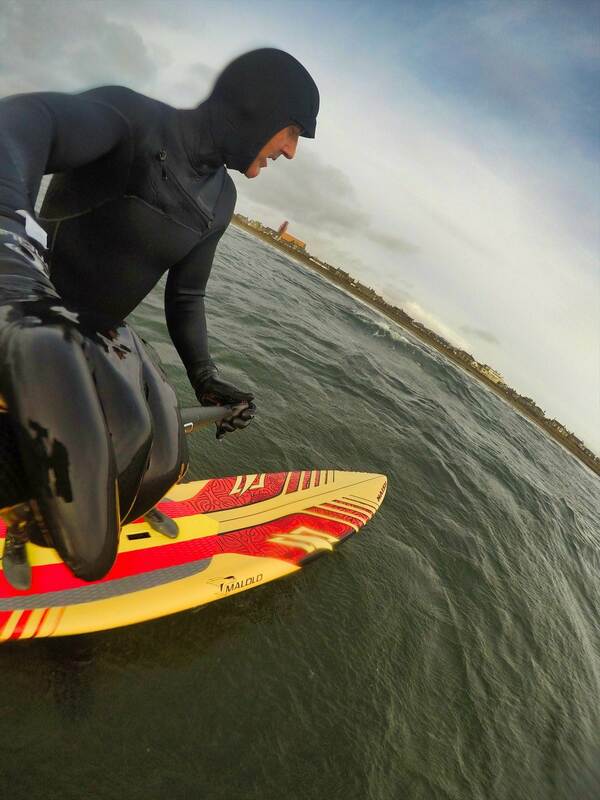 Using the 280GF I m probably 70mm forward of where I comfortably stand when I surf foil with a Go foil Kia. The burn is real at the start so pretty normal but there is a chance your foil is not quite set up right but more than likely the front strap is just making it harder as you can not freely stand in the right spot so your back leg is doing more work than maybe it should. I say ditch the strap as it's not needed for DW and see if that helps. Well what's your excuss rob cause these skinny legs currently have the fastest time for the bay run. On our run, going out in less than 20knots ave wind, makes it really hard to learn. Bumps to get you going are too flat and small and once up there's barely a thing to work with. We have a zero fetch run. If it's 25knots plus it is so much easier to get up as you have something to work with. I'm still at the stage where it seems like 80% fitness and it's killing me.....but it used to feel like 100% so it's improving. Thanks for the tips - had better day today- on my 7' er but then it was blowing abou 30knots! I finally managed to pump paddle a bit - I even did a bit of straight pumping too. As Jacko mentioned above, Leg burn will go as you progress (to a degree), but more so sounds to me like your foil is set too far aft or your stance is too far forward. Ideally for DW'ing you want to try and get things pretty neutral, as when you're dialled and comfortable, you'll be standing stall and relaxed. Back leg burn is because you're having to aid the foil to lift. Try standing behind your strap (maybe leave it in as a reference). One foot width will make a hell of a lot of difference. As you're on GF, you may also be using Deep Tuttle, which will limit your foil placement, so stance is all you have to adjust balance points. If you're using the plate adapter, then excellent, move your foil forward an inch at a time. 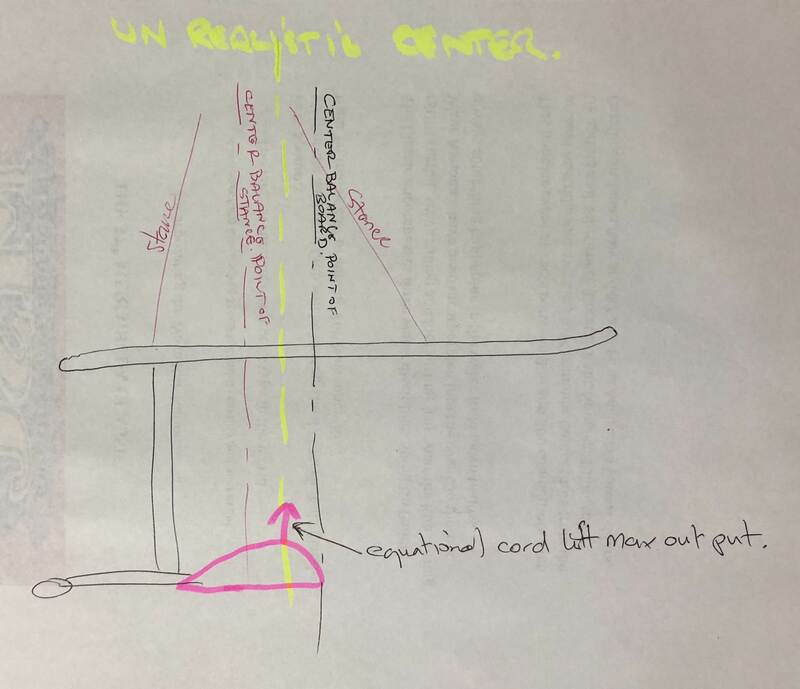 If you can imagine an image of your boards natural balance point, then you stances natural balance point then the foils centre of lift coefficient. You kind of want to work around all of these to have a feeling of balance but still control. If you go too far neutral, you can loose a sense of control. I hope this helps, I did do a dodgy drawing some time ago about this, but can't find it. Will pop it in if I do. Here it is, dodgy as all get out. But this is really roughly what you're trying to achieve to get neutral balance. The equation of all the forces (roughly) equalling out to a degree. Pretty dodgy pic, but you get the idea. Classic error, great work getting onto it Rob. You will find that in Hawaii you will stand in a different spot and have your foil slightly aft than you will in Aus. Just because of the power in the ocean. Here's a quick minute from a DW'er I did yesterday in 10kn (possibly less, wind looked good before and was building, but died as soon as we got out). 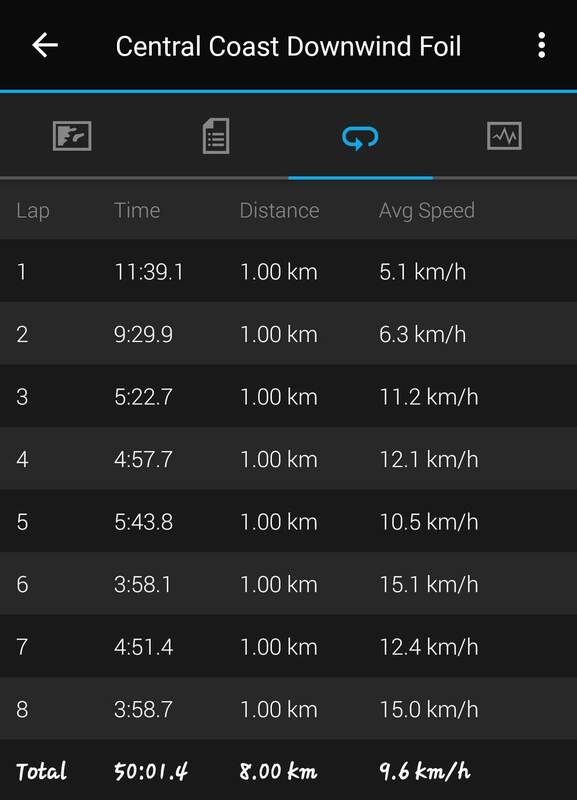 Hard work and only 1-1.5km at a tim glides, but still plenty of fun. Interesting stats Rob. We got skunked here after work. Keen to do one of those lake runs. Looks like you had less dead periods than we got Sunday, you don't go very fats in 10kn when you're off the foil. Good work on the HR though - Wow. This is a pretty typical day in Adelaide for us. We dont get much ocean swell as we are tucked up in the gulf but we do get a pretty good seabreeze. We only need to paddle out about 400m just so we miss the first jetty. Downwinding is way too much fun! Where's your heart rate at Trav? (out of interest). I am usually around the 175-180 mark at max and Av. around 145-160. Ave 161bph and maxed out at 191 it was the 2nd run of the day. Very nice run Mr Murf - you barely had a touchdown if at all? 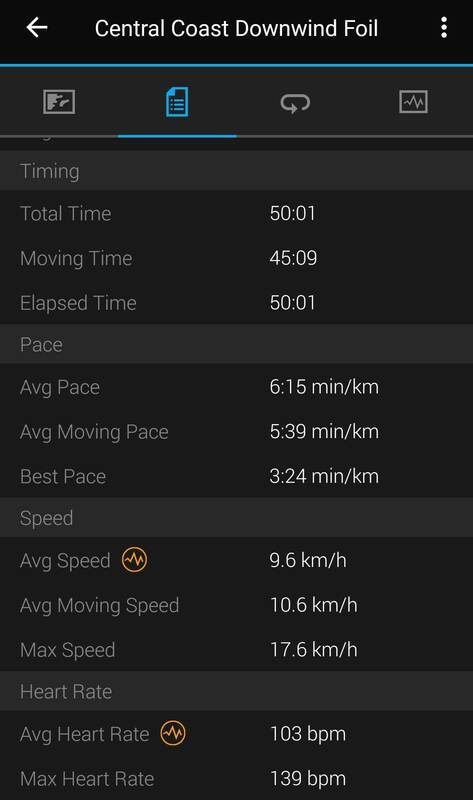 My graphs are a little too rugged for public viewing - my best 1km is 3:21 but I can never maintain as I run out of steam and runway. Our second half is distinctly more challenging than our first and it really punishes anyone who doesn't have the skills and/or stamina to stay up on foil without assistance from the bumps. I'm beginning to believe the holy grail of dwd foiling is the ability to pump unassisted by any bumps for at least 200m. On a good day I might make 50m but (very) slowly improving. Knowing how to pump helps a lot but the best tip I can give is not to chase the runs down the runs in front of you but peel off the run you are on and hook onto the run coming from behind you. Saves a lot of pumping and energy. Ot made a massive difference in the way i downwind now. They're like Andy's numbers (I think he hits 195's). You young lads with your higher HR's. Need to meet up for a foil next tri[ for sure. I call it retreating, but same thing. It is super important to et this timing right, or you will be working hard. I use the term retreating as you're kind of bailing on a good run (i.e. retreating). It is so hard to retreat/peel off when you're flying along and everything feels awesome! Here's a try an explaining how I try and time it. 1. Paddling and pumping for your bump. 2. If there's no chop or prop to get you up and the bumps seems like it's going to pass you by, let it go, slow down and regain energy. then hit the throttle again as you're coming off the back of it (very important), you kind of want your first paddle pump to be as the next bump is forming behind your board (don't wait too long or it will pass you too), it will feel a little dead and un-aided at first, but quickly become easy and get you foiling efficiently. 3. Once you get up on the foil and have gathered speed, it is time to start thinking about your first retreat. It is important to ensure you have speed, but do not wait too long. 99% of errors IMO are from staying on your pump for too long and drawing out the speed. As soon as your speed spikes, get off and use that speed to go hunting. 4. This is the tricky part, you will hardly be able to see what it is that you are going for (you will learn to read it really well the more you do it), but you need to turn for it early and align your momentum in a very similar fashion to point 2. (before the pump has reached you and properly formed). It will feel like your turning straight in the "pit", and your inner thoughts are going to be like WTF R U Doin! But it will all happen, the pump will form up behind you, and your speed will increase again, and if you've done it well you may not even have to bounce, pump or paddle at all. Then we repeat the process. I guess the key thing I always say, is do it way before you think you should. Retreat earlier, change bumps earlier, paddle earlier and so on. When you get in the groove, it is amazing, and will feel like you're floating on nothing at all but cruising at a good stable pace with little effort. Don't be in a rush, learn to hold your foil back, fly high. I like using an 80cm mast for DW, and I use every cm. Slow, smooth and calculated. Most of all, just get out there and do it. Every session you learn something. Are you fricken kidding - 80% technique ? When my heart hits 150 I throw up! Great tips in there JB - out of interest: How proficient are you at pumping in the flats? You've clearly nailed it on the DWD but can yo do 200m after pulling out of a wave? I'm obsessed with cracking the dwd foil code and I'm practicing pump-technique when there isn't enough wind to dwd. I think it would be useful if one could establish a rule of thumb for when you might be ready to crack a no touch-down dwd on foil and whether you think the 200m flat pump is it?